WS.WebTV Professional is a complete, flexible and easy to use, online video (Video CMS) and media platform. Through extensions, it is possible to add support for user registration, content access restriction, Pay Per View (sell your videos online), news and events sections, image galleries, and much more. Please, note that the content (video/channel titles, descriptions, etc.) will remain in English regardless of the selected language. Resell WS.WebTV Professional along with your value added services (like installation, hosting, streaming, CDN, graphic customization, content creation...). Unbranding is available so that you can offer the solution without disclosing who is the developer (the documentation is available in this modality too). A subscription license model is also available for resellers. We are devoted to the quality of our product. If you find a problem with our solution, you can rest assure that we will do our best to fix it in the shortest amount of time. WS.WebTV Professional is intended to be installed in your server not on ours. WS.WebTV Professional is a complete Video CMS (PHP Video Script / Web TV / OVP: Online Video Platform), with HTML5 and Flash video playback support to achieve the best possible compatibility with PCs and mobile devices. It is a platform that not only allows you to have your own video portal but also, through extensions, it can be turned into a monetization platform (with Pay Per View), with user registration (and user-created content), news and events sections, image galleries, and much more. All managed through a very easy to use administration interface. Besides, the solution has a variety of social features that will help you in distributing your content to social networks. WS.WebTV Professional is a powerful sales and marketing tool that allows you to create your own video channels in Internet, with your own content, your own publicity and with your own identity; without depending on other Websites like YouTube, Vimeo, etc. Our solution is intended to be hosted in YOUR SERVER, so unlike other Video CMS / WebTV solutions, the files are stored in YOUR SERVER not on ours. Use the hosting service of your choice as long as it meets the minimum requirements. Finally, WS.WebTV Professional can be used as your primary Website, or as a complement to an existing one. Not only video: text pages, galleries, news**, etc. A WebTV is suitable for multiple applications/fields: TV/Movie production, corporate TVs, tourism and entertainment, video brochures, medicine, real state, architecture, health and beauty, e-learning, news, social events (weddings, birthdays, etc), sports, art and culture, museum, public records, religion, society, science and technology, toys, content for youth and kids, home and family, and many more. After reading the previous, do you still plan to use any those online video sites as your main, official, online video portal? WS.WebTV is not a "template"
Unlike other solutions available in the market, which are simply templates for other CMSs (like WordPress, Joomla, etc. 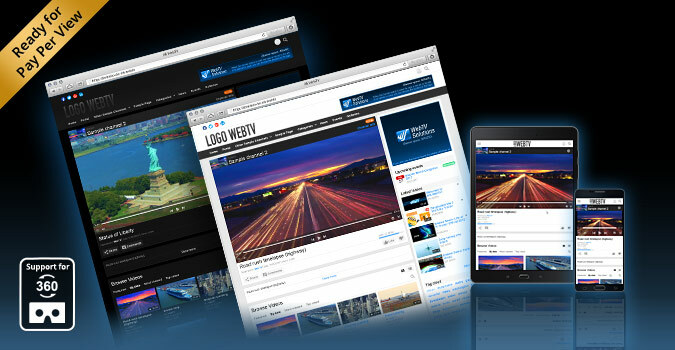 ), WS.WebTV is a complete and proprietary system, specialized in video, and not based on other CMS. There are other CMSs (like WordPress) commonly used for creating video portals. The fact is that since the native functionality of those CMSs is not focused in managing video content (only to a basic level) it is necessary to use plugins that add the necessary extra features (in several cases it is necessary to add several plugins, most of the time, from different developers). The possibility of using third party plugins on those CMS is great and terrible at the same time because they come from different developers. This is a source of potential security and maintenance problems because every time the CMS is updated (which is very frequent, for example, in the case of WordPress, because of security) it is also necessary to make sure that the plugins are compatible with the new CMS versions and, at the same time, -and separately- the plugins must be kept updated. WS.WebTV is a proprietary system. All features and extensions (NOT plugins...) are 100% integrated in the system and they are developed by the same company; therefore, with each new version released, the whole system gets updated (no compatibility or security issues derived from the extensions). Additionally, the system is focused in managing video content: the video players (Flash and HTML5), the security functions (like the generation of tokens/signatures for the video URLs, preventing concurrent user sessions, IP blocking, etc. ), the file storage management, the content access restriction, etc. are native. Finally, due to its nature, our system is less prone to security issue; although the previous, we are committed to our product and if you ever find any security issue you can rest assure that we will solve it in the shortest possible amount of time.